2. Volcanic Ash Exfoliator: this exfoliant is one of my new favorites - I use it 2-3 times a week and I use it in the shower; it makes cleaning it up easy since it quite literally looks like volcanic ash! A little bit goes a long way, so you definitely get your moneys worth with the size of the bottle. 3. SUNDAY Sweatshirt: everyone needs a designated Sunday shirt, right? This pullover is so comfy and I always look for the new designs as they come out for cozy and super affordable lounge wear. 4. Electric Blanket with Foot Holes: guys, GAME. CHANGER. Electric blankets are nice but know what's nicer?? An electric blanket with spots for your feet!!! Best purchase ever. 5. Eye Gloss Cream Eye Shadow: when I was in 7th grade and just starting to wear makeup, I had this Revlon eye shadow palette that I LOVED. It had four, neutral colored cream shadows and I used it like it was nobody's business. This eye shadow has brought me back in time and I can't say I don't love it, haha! The shade shown above is "unicorn" and it's as magical as it sounds - it's SO shimmery, beautiful and beyond pigmented. It's a little jar, but the tiniest bit of product goes such a long way, especially with how shimmery it is. There's lots of colors to choose from and they're half off right now, so try one or two out! You'll love these! And if you're a color fanatic, love the Pantone shades and covet everything in that year's color, you can get this shadow in the Pantone color of the year - ultra violet! I'll admit I don't ever see myself wearing violet eye shadow, but it is SO pretty! 6. Bucket List Tin Prayer Box: this $12 bucket list box is one of THE cutest things! It'd be a great gift or just for yourself; it comes with a bunch of paper notes and a pencil so you can make yourself a bucket list for 2018! 9. Pearl Embellished Sweater: I feel as if this sweater has been so high in demand since it came out, it keeps going in and out of stock! I finally got my hands on it and it's just as pretty in person as it is online. It's really soft too and a great length - but I'd size up if you want it longer (to wear with leggings, etc). 10. Acrylic Sunglasses Holder: 'get organized' is such a general goal that I think we all try to make, but it's way easier said than done - and if you're not specific, you'll likely never get your crap together. I know we've all been there! *cough me every year cough* so this acrylic organizer is a must! Especially if you hoard sunglasses - such a fun way to display them and know exactly what you have. Plus it's $13! 11. Nike Running Sneakers: I LOVE these sneakers soooo much. The color is so pretty - who doesn't want need new workout gear to get back into shape post-holidays? Treat yourself! 12. Kitchenaid Sheet Cutter Attachment: this is one of the coolest kitchen accessories EVER if ya ask me! It's a sheet cutter attachment that fits right onto the end of your Kitchenaid Mixer and it cuts veggies, potatoes, etc. extremely thin. I actually first saw this on an infomercial really late one night and now it's pretty much my favorite thing ever! That blanket looks amazing! We're getting some crazy chilly temps in FL so I've been living for coziness, haha. That gray sweater is the cutest, I've been seeing it every where!! 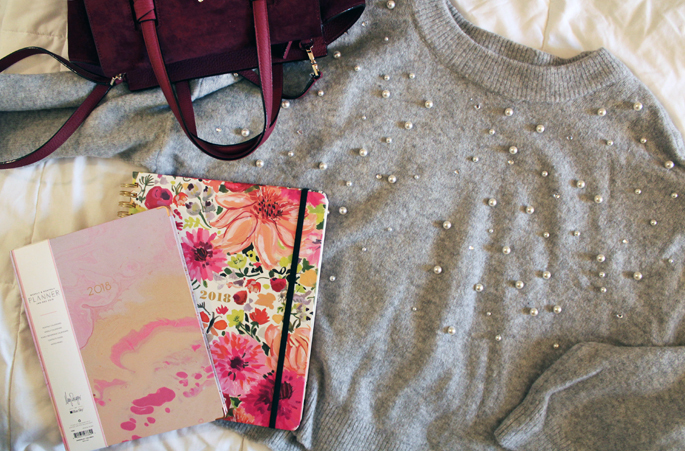 That pearl embellished sweater is so darling! I'm quite picky with my planners as well, but I have used an Erin Condren for the last 2 years now and I am quite happy with them. The paper for this year's planner is ahmazing! Adore that Kitchenaid! I've been soooo excited about this New Year as well!! ahh i want it all! my friend actually has the pearl embellished sweater and its SO cute IRL! Ahh! I need that electric blanket in my life! Heated blankets are my favorite things ever! I'm loving that pearl sweater, too! That pearl sweater is so pretty! Okay, I need that electric blanket! The temps have been in the negative here! That planner is to die for! I think I LOVE all but one item on this entire list. And the Sunday sweatshirt is on sale for $15! Win! Comfort is my thing and that sweatshirt is adorable. Oh I need that sheet cutter for SURE! They can be so expensive but I just need to cough it up and get it because I know I'd put it to good use! Cute finds!! Yes to all of these. I definitely NEED that electric blanket in my life. Good holes?? That really is a game changer. That bucket list prayer box is so cool! OK, I need that pearl sweater in my life! I'm all about the pearl trend and this one is too cute! I'm such a sucker for mules, especially the ones with a little heel on the. I also need to invest in an electric blanket. I'm always cold! I need to check out that volcanic ash exfoliator. It sounds amazing! Love love love that embellished sweatshirt! Really Great post! I am actually getting ready to across this information, is very helpful for me my friend. Xerox Printer Customer Service Thanks for sharing such an amazing article.